Mark Madsen • The retiring lawmaker says last week's Republican convention only "reinforced" his decision to change affiliation. Francisco Kjolseth | The Salt Lake Tribune Senator Mark Madsen, R-Saratoga Springs, sponsor of the medical marijuana bill SB73 speaks in a packed hearing at the Utah Capitol. Senate Judiciary, Law Enforcement and Criminal Justice devoted its entire committee hearing to the bill and the Medical Cannabis Act. 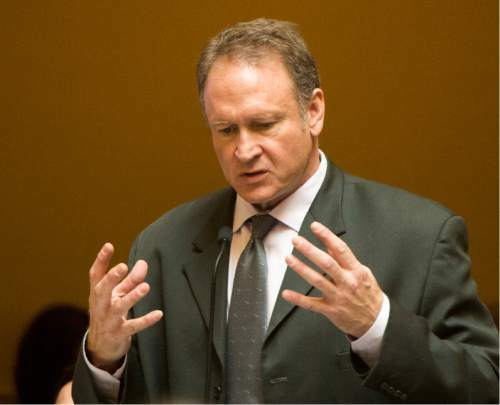 Rick Egan | Tribune file photo Utah state Sen. Mark Madsen R-Saratoga Springs, is bolting the Republican Party and is signing up as a Libertarian. Rick Egan | The Salt Lake Tribune Senator Mark Madsen R-Saratoga Springs, sponsor of the medical marijuana bill SB73 discusses his bill on the floor of the senate Friday, February 19, 2016. While announcing Monday that he will leave the Republican Party to become a Libertarian, state Sen. Mark Madsen said he wants to avoid "any improper connection of the dots." His experience as a Utah delegate at the Republican National Convention last week didn&apos;t change his mind, he said. Rather, it failed to change his mind. "Every decision and inclination I had before was reinforced," said Madsen, who went to Cleveland in support of Texas Sen. Ted Cruz and witnessed his state&apos;s failed bid to deny Donald Trump automatic nomination amid jeers from Trump backers. "No party is entitled to my membership or my support," said Madsen at a news conference announced on short notice, on a state holiday, no less. 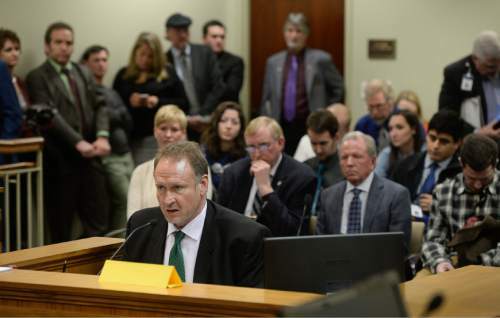 He becomes the first sitting Utah lawmaker to bolt his party since 2002, when Rep. Eric Hutchings, from Kearns, switched from Democrat to Republican. Madsen is retiring this year after three terms representing Senate District 13 in Utah County and acknowledged that his move is "largely symbolic." The move wasn&apos;t spurred by the GOP&apos;s nomination of Trump, he said  though he did cite concerns about the New York billionaire&apos;s inexperience. Madsen previously voted for Sen. John McCain, former Massachusetts Gov. Mitt Romney and President George W. Bush, he said, even though they weren&apos;t his preferred candidates. Nor, Madsen said, was the switch driven by the defeat of his medical marijuana legislation in this year&apos;s session. He had "toyed" with becoming a Libertarian prior to running that bill, he said, and might have if he didn&apos;t think it might hurt the bill&apos;s chances. He credits his move to a slow-boil change in the Republican Party  where he said "the scales tipped" away from those who espouse the strict civil liberties of Thomas Jefferson and toward those who favor the progressivism of Theodore Roosevelt  and his frustrations as a legislator in Utah, which he sees as "an island of progressive, restrictive law in the middle of the Intermountain West" and where he often found himself at odds with members of the Republican Party. State GOP legislation has led to a population that is "less free," he said. Madsen said a turning point came when he received calls from people in his former neighborhood complaining that the Utah County Sheriff&apos;s Office threatened to arrest them if they didn&apos;t evacuate their homes because of a growing wildfire. His research found that every other state in the region allowed citizens to remain with their property. Once Utah law enforcement spoke in opposition, he said, it didn&apos;t matter. His was the only vote for the bill in committee. When the issue of Medicaid expansion was raised in the Senate Republican Caucus, Madsen said he was one of a few who voiced opposition to expanding a "government entitlement program" that he said is "going bankrupt." The current direction of the Republican Party sometimes "makes me want to cry," he said, "because I&apos;ve invested a lot in that party." Libertarian National Committee Chairman Nicholas Sarwark said Madsen&apos;s move is part of an "accelerating movement" that includes state legislators in Nevada and Nebraska and is the result of a widening rift in the GOP establishment. "After the disaster that we saw in Cleveland, in which a party that was once storied has nominated a reality show star for president, where the convention chairman&apos;s cutting off the microphone of a sitting U.S. senator, it&apos;s broken," Sarwark said. "It&apos;s fundamentally broken and it&apos;s dying." Earlier this year, Madsen hosted Libertarian presidential candidate Gary Johnson during a visit to the Utah Legislature, and the senator introduced Johnson to the Republican and Democratic caucuses. 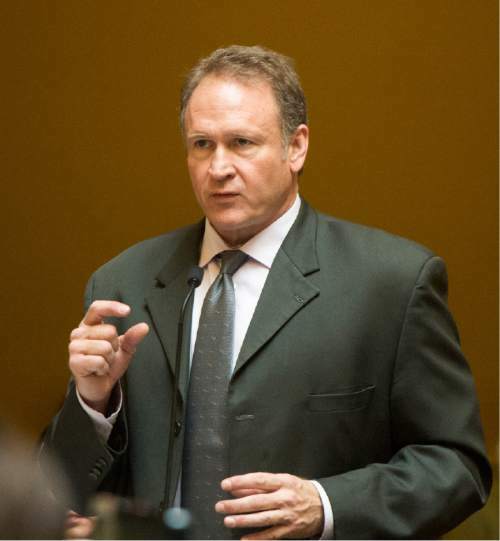 In April, Madsen gave the keynote at the state Libertarian Party convention. Then, in May, he flew to Orlando, Fla., to speak at the party&apos;s national convention. He said he&apos;s been in touch with national party officials since that visit. After Trump "sailed through" the convention, he said, he called and told them he was game for a change. While he still has friends in both major parties, Madsen said, "in the Libertarian Party, I find a lot of people with whom I disagree on any given issue, but the one thing we agree on is it&apos;s not the government&apos;s business, and that&apos;s a great place to be." Madsen&apos;s wife, Erin, said she hasn&apos;t changed her party allegiance, but she will vote for Libertarian Gary Johnson, a former Republican governor of New Mexico. For her, the convention truly was a turning point, she said. "That was my tribe," she said. "That was my people. ... I believed deeply in what I thought the Republican Party believed. But after having gone to the convention in Cleveland, I don&apos;t think that&apos;s my tribe anymore. They don&apos;t believe what I believe. And you&apos;re going to think this is crazy but it&apos;s like a death in the family for me. It breaks my heart." Madsen, of Saratoga Springs, said he still plans to move to South America, as he announced earlier this year, and that he has been back and forth to the continent on business. He expects his family to move "by this time next year." He credited his hectic schedule for the timing of his announcement, though Erin Madsen said it was fitting that her husband  a direct descendant of original Mormon settler Ezra T. Benson  would become Utah&apos;s only Libertarian senator on Pioneer Day.